Dealing with elbow tendinitis as a knitter has been challenging to say the very least. My recovery progress has been going VERY slowly, so I’ve had to figure out some workarounds. Seeing how the knitting is likely 70% of the reason I’m in this mess, I needed to figure out the best way to deal with it because what I have realized is that I can’t continue to NOT knit. I just can’t. I’m driving myself (and likely, indirectly, my husband) bonkers. I have gotten advice from an orthopedic doctor, 2 physical therapists, a massage therapist and a chiropractor. With all those opinions (some of them contradictory to each other), it’s been a little frustrating to figure out what should help me but I think I have settled on a few things to do to help my recovery progress while still being able to knit. *Disclaimer: If you are dealing with this, these may not be the right suggestions for you. It is simply what I am finding to work for me. 1) GEAR UP: When I’m going to knit, I’ve got to wear the supportive gear. A tennis (golfer’s) elbow strap and a hand support glove. 2) GO SLOW: Physically slow down my knitting. This is very hard for me because I can knit pretty fast and it takes some deliberate focus to slow down. Slowing down makes me pay attention to how I’m holding my arms and helps keep my muscles somewhat relaxed. 3) SHORT TIME FRAMES: I’m knitting for 10-15 minutes at a stretch. This has also been hard. I used to knit for several hours at a stretch. 5) REST AND STRETCH: After my 10-15 minutes, stop! STOP! Also hard for me – see #3 above. Stretch my arms/hands and then put on more gear – a wrist support that limits my wrist movement because wrist movement is what affects the elbows. 6) REST SOME MORE: I want to do another 10-15 minute knitting session way before I should, so I remind myself to rest some more. 7) YOGA: I’ve started doing yoga to get some additional stretching in, not just of my arms but everything else. How I have been holding my upper body to adjust for the pain of resting my arms on things has made all kinds of other muscles tense up. I have had A.M. and P.M. Yoga (click there to get it on Amazon) for years and just dug it back out of the cabinet. It is a beginner video and I really like it. And yoga is just so awesome in general. I always feel so good after doing it. In about five days, I’ve gotten 16 rows of a cowl done! While that is absolutely the best news – I’m actually getting some knitting done – I’m trying really hard not to think about the fact that I used to be able to knit something like this in one day. Baby steps. One last thing to tell you about — a product review of sorts because I love it so much. This being winter (sort of — it’s going to be 68 degrees here today, 35 degrees tomorrow), my hands get very dry and that can make for snagging yarn. 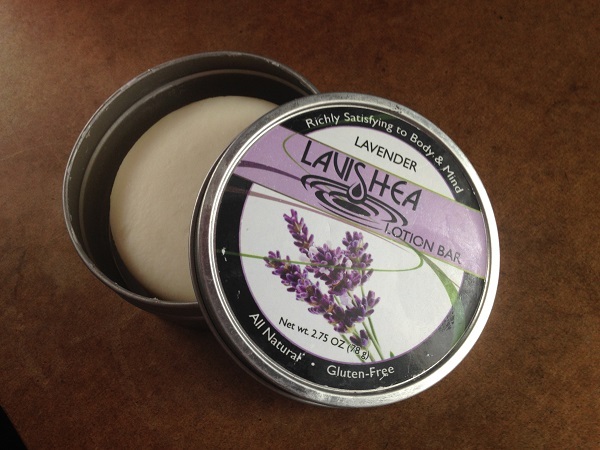 So I’ve been using my lavender Lavishea Lotion Bar. It absorbs quickly (good for when you are knitting and still good even if you don’t knit) and makes my hands so soft and it smells so wonderful. Not everyone loves lavender but it comes in other scents. It’s a little different because it comes in a bar form (not a bottle of lotion) but you get used to it quickly. And they even have a Lavishea Yarn Bar! If you try it, I hope you love it like I do. 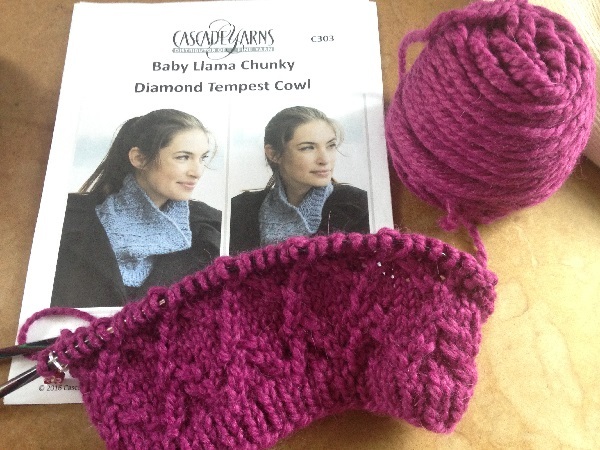 Posted in Uncategorized and tagged diamont tempest cowl, lavishea, Tangled lace shawl, tendinitis on March 1, 2017 by lizytish. Thank you Cindy! It would be HORRIBLE if I stopped knitting altogether! How long after you knit do you rest before knitting again? A couple of hours. Sometimes I just do a little and wait until the next day.